More Than 70 Percent Of America’s Silent Films Are Gone! 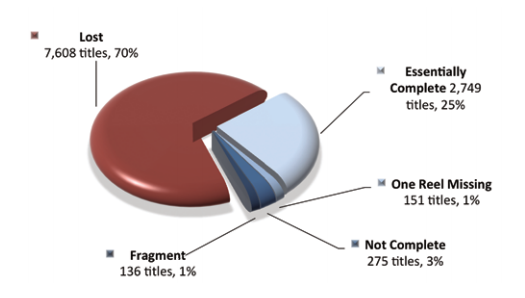 A study from the Library of Congress reveals for the first time how many feature films produced by U.S. studios during the silent film era still exist, what condition they’re in and where they are located. As you may have guessed, the news isn’t great. According to the study, nearly 75 percent of American silent films are lost forever–and a majority of the remaining films aren’t exactly in great shape, either. Of the 11,000 films made before sound film came into the picture, there’s only roughly 3,300 left. Of those, 17 percent are incomplete, and some, like the only missing Greta Garbo feature, The Divine Woman, are down to a single remaining reel. What happened? Librarian of Congress James H. Billington explains in the study’s foreword that, with the rise of sound, silent movies were seen as having little commercial value. As myopic as it comes across from a 21st-century vantage point, silent films were lost to “chemical decay, fire, lack of commercial value, cost of storage,” and most film producers were content with unsentimentally moving on toward the Next Big Thing. Billington called the report a model for the type of fact-based archival research that remains to be conducted on all genres of American film beyond the scope of silent-era feature films. He says the same level of scrutiny remains to be applied to all historically significant audiovisual media produced since the 19th century, including sound recordings and radio and TV broadcasts. Under Billington’s leadership, the Library has worked diligently to win repatriation of missing silent films held in archives around the world. Examples include a “mother lode” of some 200 missing silent films that have been stored for more than 80 years by the Russian film archive Gosfilmofond. The Russian archive is thought to contain the largest cache of lost U.S. silent films outside the U.S.
With a more complete view of what we’re missing, we might be able to better prevent losing more. Anticipating that, the Library has also released a searchable database filled with every silent feature still around. Ready to convert your memories? As a blogger of DVD Your Memories, Chris is the most regular blogger, reviewer and coder for this site. This entry was posted in Film Transfer. Bookmark the permalink.